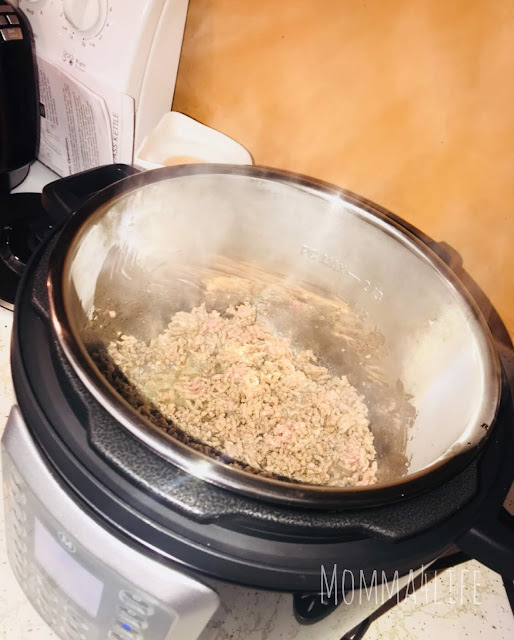 I am really loving this Mealthy MultiPot it makes so many different kinds of recipes the possibilities are endless. You can sauté, bake, pressure cook, boil eggs, slow cook, basically anything and everything you want to do you can do in this pot. 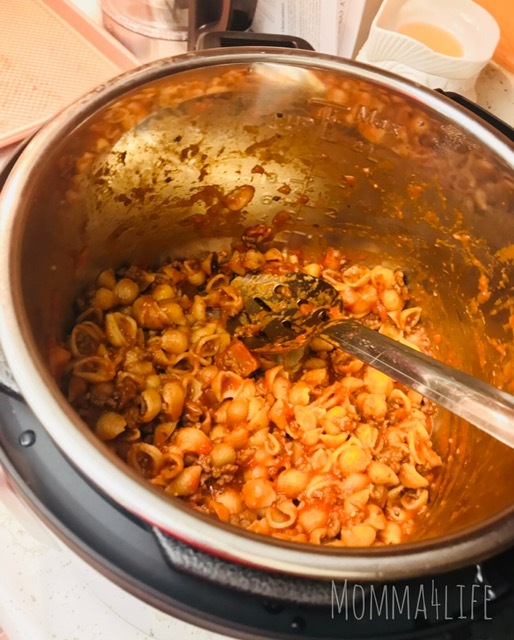 We decided to make something similar to goulash in our pot. I think honestly it takes a little more time to preheat then to actually cook the food which is not an issue for us. So I would say it takes about 10 minutes to preheat and then after that, it starts to cook. 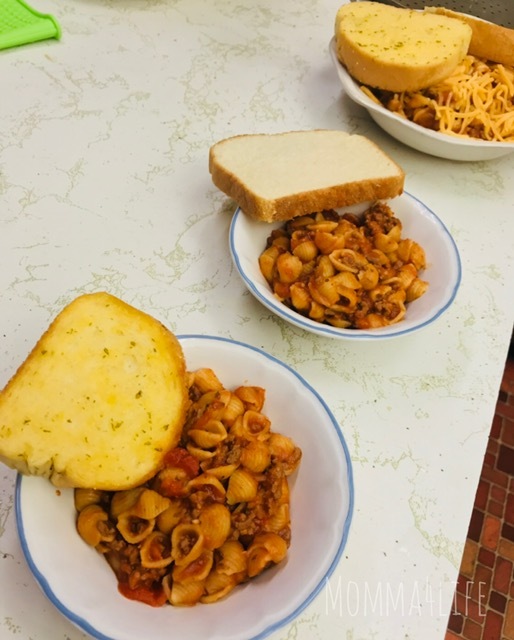 It only took four minutes to cook our goulash. 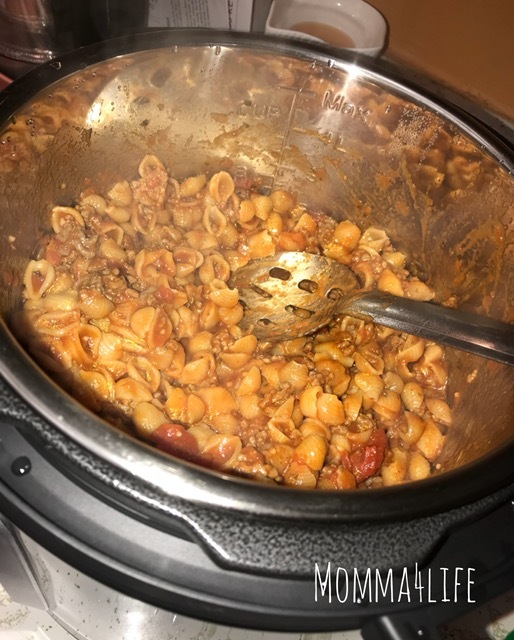 All we did is sauté some meat for the goulash in the actual pot once that was done we turned the pot off and drained the grease then we added the meat back into the pot put noodles in not cooked yet then added the spaghetti sauce. 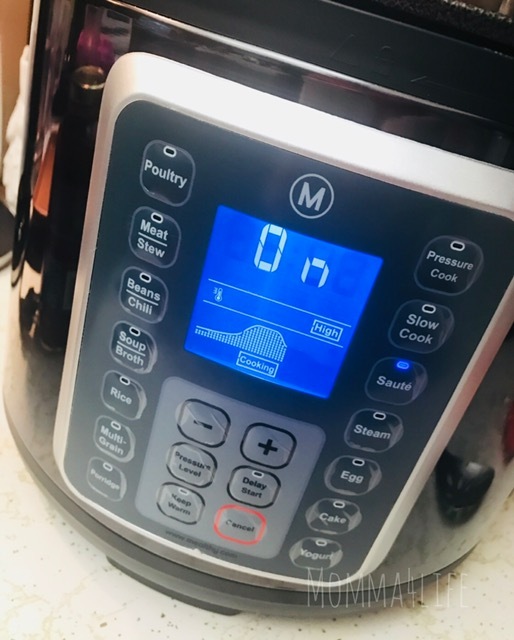 After it preheated like I said about 10 minutes then it turns on and starts to cook the timer was set to four minutes and when it turns off you slowly release the valve and then wait till the air pressure releases. And there you have it our meal was done in less than five minutes pretty amazing and I can't wait to use this over and over. 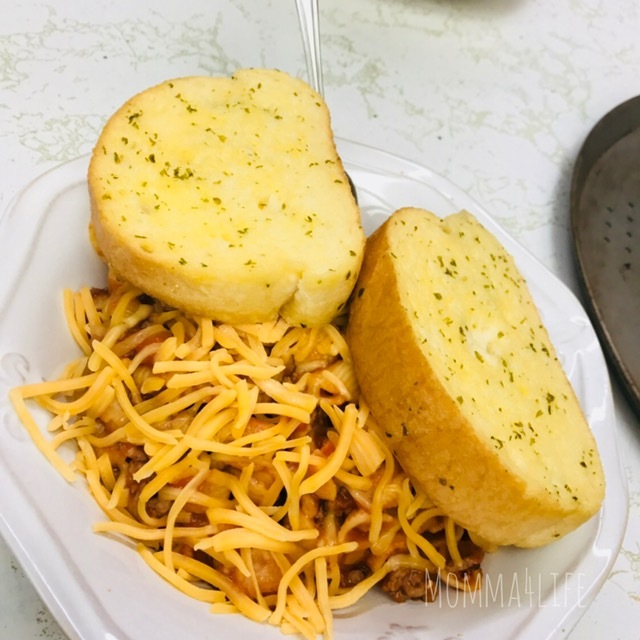 Our dinner tasted really amazing and we paired it with garlic bread. There are so many other recipes I want to try and the possibilities are endless why not make it easy to make dinners during the summer when you know you're going to be busy and not have time for it. 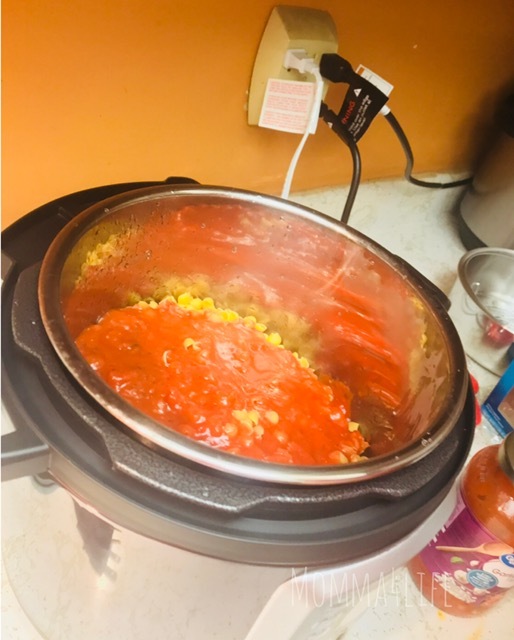 Now one of you will win a Mealthy Multipotpot of your own enter below for your chance to win!! This Mealthy Multipot sounds so versatile. Looks amazing to use for so many recipes. What a time saver too. Great giveaway. i love a homemade vegan chili, it is my favorite recipe. i would love to see some vegan recipes on your blog. My favorite recipe would be a vegetarian chili recipe. I love to see on this blog reviews about different types of healthy foods. My favorite recipe is baked potato soup with all of the garnishes. I would love to see more soup recipes as I love to make soups all year long. My favorite recipe is Chicken wings. I would like to see giveaways for dogs. I love the pasta dish! YUM! I'd like to see recipe and giveaway posts. My favorite recipe is soup - any kind of soup - but especially Tuscan Vegetable Soup. 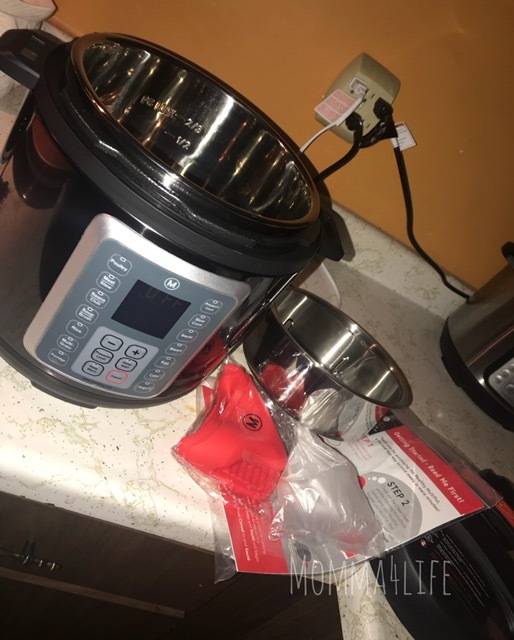 I'd love to see more recipes using this Mealthy product, especially pressure cooker ones. I enjoy making different types of bean soup recipes in the winter. I like to see blog posts about different types of natural cleaning products. My favorite recipes are soups that I create with whatever sounds good at the time. I love to see new recipes! I do like to make different type of stew recipes. I like to see reviews of animal products. One of my favorite recipes are squash bowls. Another is ham and cabbage. I would like to see recipes that use most common ingredients but not like common meals. I love to make different types of grilled cheese sandwiches along with a bowl of soup. I do like to see on blogs different types of vegetarian recipes. I do like to make different types of oatmeal recipes. I would like to see and read about on blogs different types of pet treats or pet toys for cats or dogs. I like find new soup recipes. I'd like to see more recipes. I do like to make egg omelettes with vegetables. I like to find and read about on blogs tips for cleaning our home and different products. Favorite recipe is chicken noodle soup. Would like to see more quick and simple recipes. more recipes and cooking tips and tricks..im pretty terrible at cooking. also anything household/diy related. my favorite recipe is for chicken corn chowder..my number one comfort food.